From Beast Kingdom. A PREVIEWS Exclusive! Beast Kingdom is celebrating the 90th anniversary of Mickey Mouse with fans from all around the world. The 'Master Craft' statue series, created through exquisite clay sculpting and delicate hand-painting and assembly, is releasing the new Tuxedo Mickey statue, holding a top hat in his hand. Each day you spend with Tuxedo Mickey will be full of heart-warming and exciting moments. Using their masterful skills, the professional clay sculpture designers at Beast Kingdom have captured Mickey's spirit in every crafted detail and the warmth of each line. The matching of bright colors and the painting techniques for layered shading have transformed Mickey from a 2D image into a real 3D character. 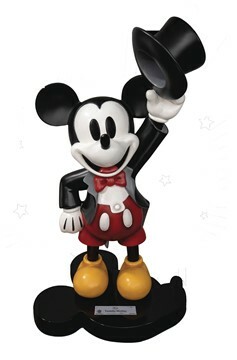 Let's celebrate the Mickey 90th anniversary and reminisce over these nostalgic memories together!.